They used to say in Victorian England that good butlers do not respond to requests. Instead, they anticipate their employers’ needs and fulfill them so employers don’t need to ask. 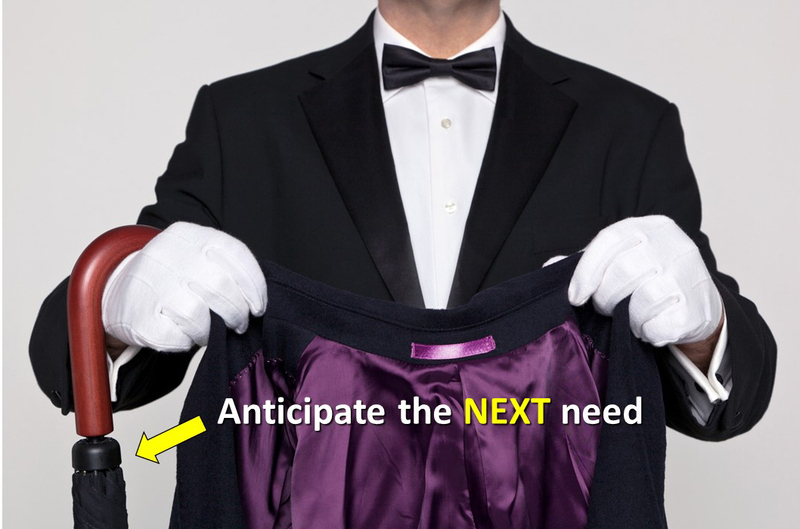 Today, the principle of anticipating needs – while the rest of the planet becomes increasingly focused on filling orders – is more important than ever in differentiating your service. An electrician for example, while looking at the wiring plan for a home renovation, suggests also installing lights in high use closets that activate when the closet door opens and closes. A hair stylist suggests a style that the client can easily recreate at home. An executive assistant briefs his supervisor on background info about the client for the supervisor’s upcoming meeting. In short, to be seen as a Trusted Advisor, you need to continually demonstrate that you’re focused on your customers’ and coworkers’ strategic needs; not just their immediate requests.